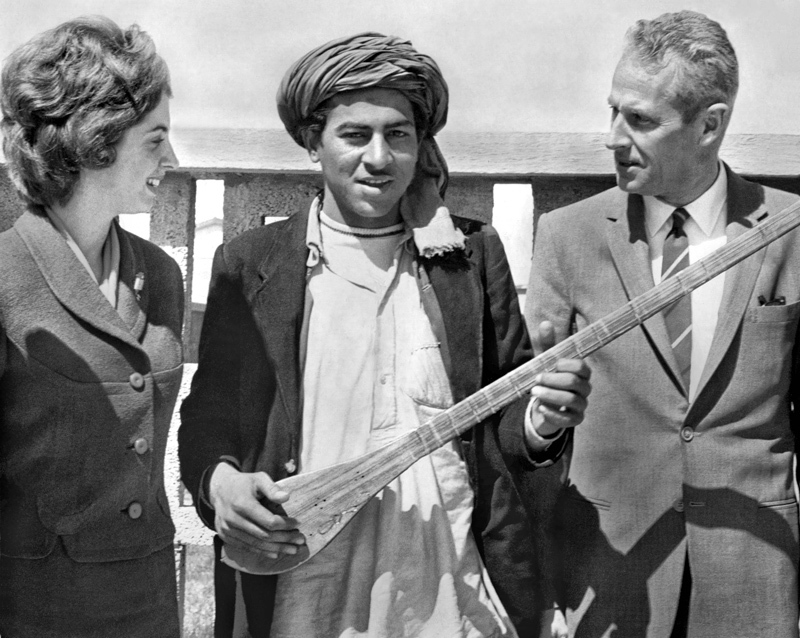 In Small Things Remembered » Pianist Ann Schein and Public Affairs Officer Harold Otwell meet a young Afghan tambor player. The 25-year-old pianist’s concert in the Radio Afghanistan auditorium was organized by the Afghan Institute of Fine and Performing Arts and the United States Information Agency (USIA). Schein played pieces by Beethoven, Chopin, and American composer Charles Ives. She said of her experience, “I find the country exhilarating and a revelation. I loved every minute of it. That may be a cliché, but it’s true.” Before leaving, Miss Schein traveled to Istalif with U.S. Ambassador John M. Steeves, where she acquired her very own tambor. Courtesy of the National Archives Still Picture Unit. 306-PS-77-P-65-1734.